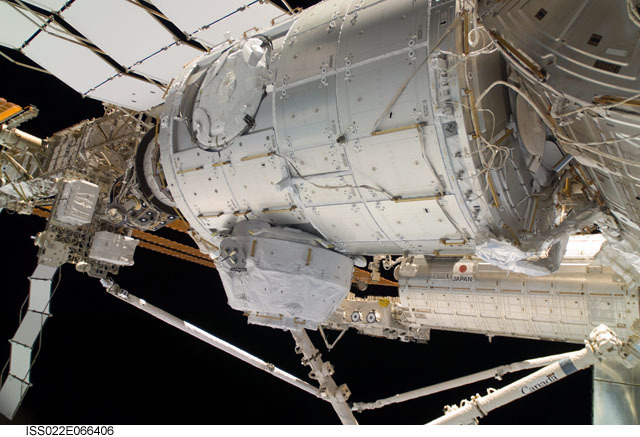 Node 3 "Tranquility" - a modified version of the original Node 1 "Unity" module (NOD1) - was the third european-built module, and the last Node-series module, brought to the station aboard Space Shuttle Endeavour on STS-130 in February 2010. It contains the station's central life support systems (WRS, OGS and ARS) and a "bathroom" (WHC). As there are no vibration-sensitive experiments at Node 3, one of the racks is used to hold the second treadmill: T2. Due to its space requirement, ARED is now stowed in the CBM "ring" of Node 3, in front of an unoccupied berthing port. Node 3 "Tranquility" after successful installation on STS-130 in February 2010, with PMA-3 during relocation from NOD2-forward to NOD3-port. The japanese Kibo module (JEM-PM) can be seen in the background. Last updated: 03.08.2015 by Editor not found.